In the exhibition, Letters of Stone, running currently at the Friedrichshain-Kreuzberg Museum (FHXB) in Berlin, Germany, you learn that the first official “Stolpersteine” (stumbling stones) placed in Germany, were for Siegfried and Edith Robinski, relatives of South African anthropologist Steven Robins. Stolpersteine are brass covered pavement stones that “memorialised Jews persecuted by the Nazis”. Placed outside the homes where deported Jews had last lived, they commemorated the painful history of Jewish expulsion and extermination. Surprisingly, then, the Stolpersteine placed for members of the Robinski family also appeared to locate South African memory in the streets of Berlin. 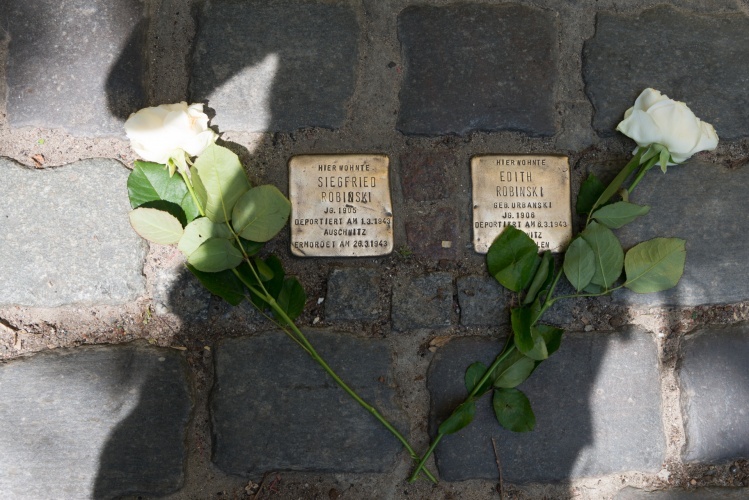 The installation of the Stolpersteine formed part of Robins’s decades long journey, told in his book “Letters of Stone”, to trace his family history and restore their dignity as Holocaust victims. 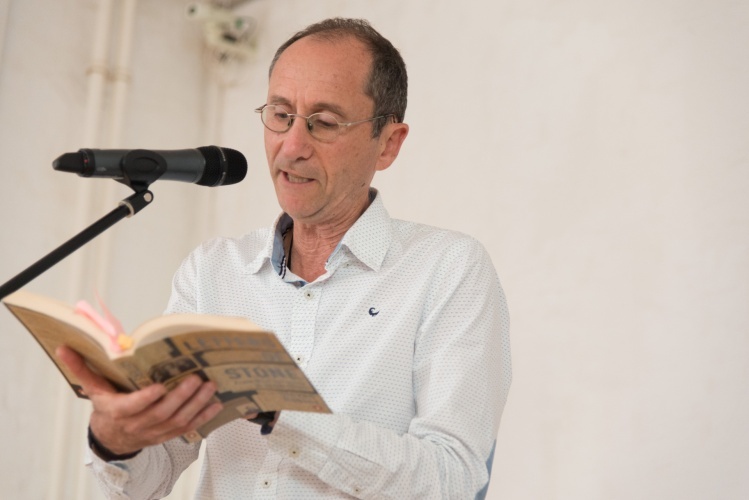 The book revolves around a careful reading of a collection of handwritten letters but it also references the history of anthropology and German race science in southern Africa. “Letters of Stone” ties the personal story of restitution into an academic history linking Germany and South Africa. The book is also about material stuff that makes telling stories and recalling memories possible. 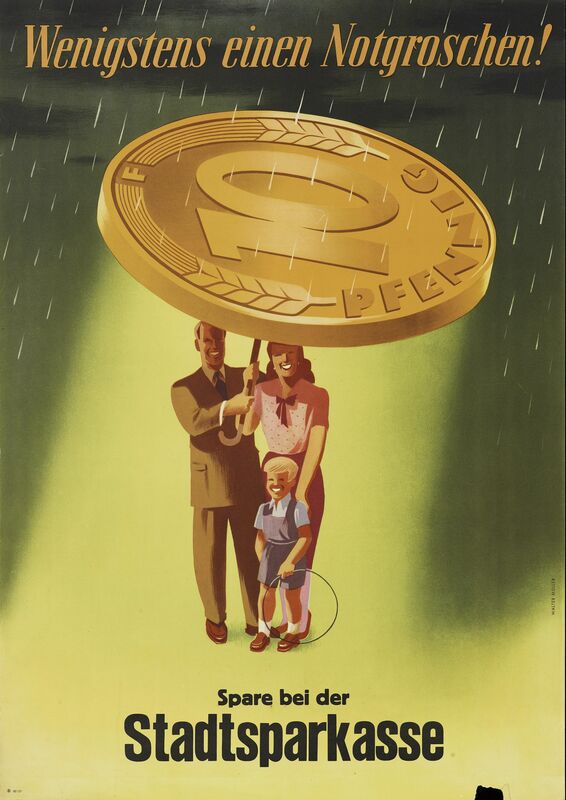 By referring to museums, paper texts and brass plaques, it says something about the basic stuff that makes memories possible. And while this is about one author telling the story of his family, this project involves many people contributing to a better understanding of Jewish histories. Three moments in the book bare this out. One major turn in the uncovering of the Robinski family story came in 1996 when Robins visited the United States Holocaust Memorial Museum (USHMM) in Washington DC. Struck by the “disorientating effect of the exhibition”, the sheer heaviness of mass extermination, he approached a librarian and explained that his “father’s family had perished in the Holocaust”. The librarian pulled out a copy of the Berlin Gedenkbuch, the register of the last known addresses and dates of deportation of Jews living in Nazi era Berlin. There he discovered the names and fates of “Cecilie, David, Edith, Edith (Siegfried’s wife), Siegfried and Hildegard” Robinski, names he had until that point not known. I felt like a detective stumbling across the first hard evidence… What had once been vague and abstract knowledge now took on a concreteness and facticity. But it could have been different. The museum project was launched in 1978 by the then US president, Jimmy Carter. But progress was a struggle, as historian Edward Linenthal shows in his behind the scenes story of the making of USHMM, “Preserving Memory”. Officials wondered about how to include the story of the Holocaust into the story about the American nation. The USHMM was officially dedicated in 1993, roughly three years before Robins’s visit. What is important here though, is that there was an institution in Washington stocked with a collection of important objects and books like the Berlin Gedenkbuch. Also, that there were competent librarians who knew what information to make available to visitors – that all made it possible for the author to find this information about his German family. Using the information in the Gedenkbuch, Robins was able to find his relatives’ last known address in Berlin. The director of the FHXB, Martin Dusphol, suggested that it would be a fitting memorial to place Stolpersteine outside this house. With Dusphol’s help, Robins approached Gunter Demnig, the artist who made and installed the Stolpersteine, and initiated the process of placing Stolpersteine with the Berlin City Council. The Stolpersteine started off as part of an art project by Demnig that documented the first order for deportations in 1992 in Cologne. The project grew in that city, but then through another art project, Demnig came to Berlin and installed 55 Stolpersteine in the city’s Kreuzberg district. Placed as art objects that were meant to make people stop, think and remember the city’s former Jewish residents, these Stolpersteine were illegal although tolerated, because of their social importance. There are now tens of thousands of Stolpersteine all over Europe, and the project is ongoing. 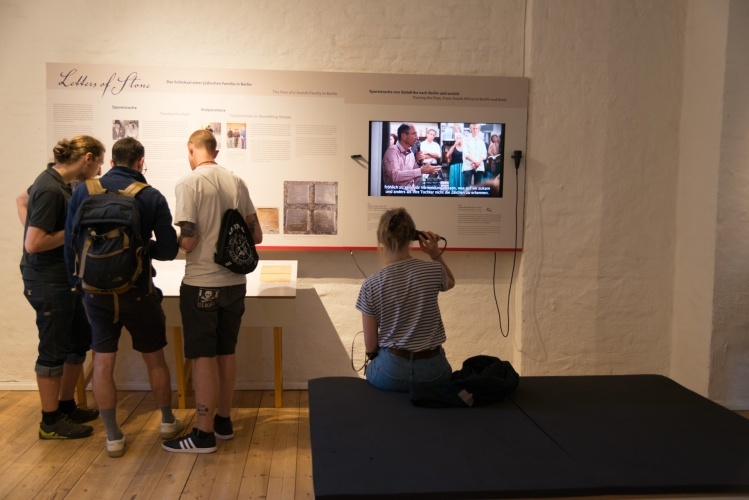 Much like the District Six Museum in Cape Town, which memorialises black people who were forcibly removed under apartheid, the FXHB documents the history of the colourful and rapidly changing neighbourhoods of Kreuzberg and Friedrichshain. It has been instrumental in facilitating the installation of Stolpersteine across Berlin. With the assistance of this important institution and people working there, the first official Stolpersteine commemorating the last home of the relatives of a South African anthropologist was installed in Kreuzberg. But the story of Robins’s relatives took another sharp turn with the surprising discovery of a parcel of handwritten letters. It was a small, decades old collection documenting a fraught correspondence between relatives from 1936 and 1943, the Nazi era. Stored in a plastic bag, in a cool, dark place, they had been protected as a family archive. But the stories they were meant to tell were largely unreadable, since many were written in an old German Gothic Script. They needed to be decoded before they could be translated. And so the letters were scanned on a computer and sent to the FHXB who helped translate them into standard German. It was through connections established at the Holocaust Centre in Cape Town, that Robins met Ute Ben Josef, an art historian and former librarian. She became the translator and primary interpreter of the letters, revealing a deep, difficult family story that stretched from Germany to South Africa. 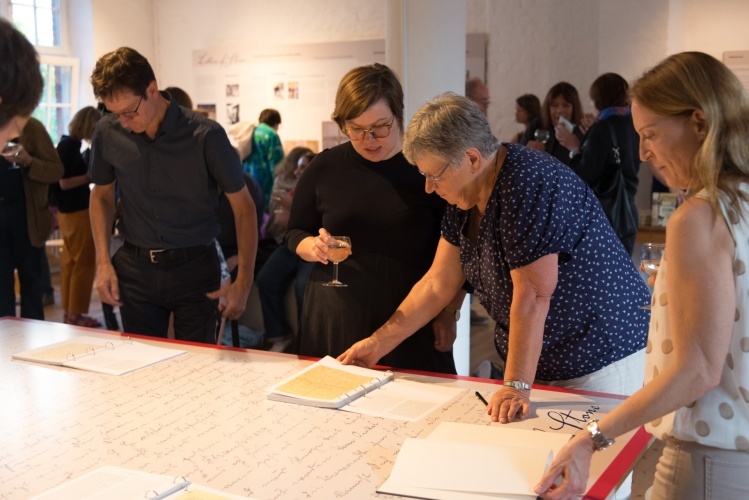 The exhibition “Letters of Stone” shows that there is more to memory than words and ideas. Referring to letters, books, brass plaques and archives, it is also about the materiality of memory, and how material things make a scaffold that supports people’s memories. Moreover, it shows how the recovery of memory and history is social and collective, involving many people who all add in different ways in making an understanding of the past possible. –The exhibition Letters of Stone runs until the 12th of November, 2017 at the FHXB in Kreuzberg. –This article was first published as “Holocaust story tells how material things make a scaffold for people’s memories”, on The Conversation Africa, 10 September 2017. Duane Jethro is a Post-Doctoral Fellow working at CARMaH at the Humbolt University, Berlin. A graduate of Utrecht University, his PhD (2015) dissertation combined religious studies theory with ethnographic fieldwork research on new heritage projects in post-apartheid South Africa. He is currently working on a book addressing the evocation of the senses in heritage claim making processes in post-apartheid South Africa. He held a Post-Doctoral Fellowship at the Archive and Public Culture Research Initiative, at the University of Cape Town in 2016. Duane Jethro is funded by the Alexander von Humboldt Foundation.